When I was trying to think of a good trip for the 4th of July weekend, it dawned on me that I have never spent any time at all along the Lake Huron shoreline. For one thing, Lake Michigan is a lot closer, I live less than 40 miles from it towards the southern end, so I can do day trips along Lake Michigan on a regular basis. The northern coast of Lake Huron is a different story, it is about a 5 hour drive for me. Another reason is the sand dunes along Lake Michigan, because of the prevailing winds, almost the entire Lake Michigan coast is sand dunes. We’re fortunate in that there are miles of Lake Michigan shoreline protected in various National, State, and local parks, and I haven’t even hit all of them yet, so it’s hard to find time for other places. From what I understand, the coast of Lake Huron is very much different in some ways, more rugged and rocky, but with some sandy beaches here and there. Well, I am going to find out for myself, and who knows what other scenic wonders and historical sites I’ll find. Also, the only waterfall in the lower peninsula of Michigan is on the Ocqueoc River, which flows into Lake Huron, and is a pretty good trout stream from what I have heard. I have never been to the falls, even though they are not far from the Pigeon River Country. There is a state forest campground near the falls, the Ocqueoc Falls State Forest Campground, and a system of trails as well, the Ocqueoc Falls Bicentennial Pathway. Then there are the lighthouses along Lake Huron to visit also, there are many of them, and I have never seen any of them except in pictures. The area I am thinking of covering on this page is from just south of Alpena, Michigan, to the Straits of Mackinac, and I will include some state forest campgrounds that I can use as “base camps”, and then do day trips from them. The places for the day trips will be State Parks with hiking trails, natural areas, nature preserves, lighthouses and other historic sites, and whatever else I find interesting to me as I build this page. I have added a page for a week long vacation in the Presque Isle area. It covers both the old and new Presque Isle lighthouses, Thompson’s Harbor State Park, the Besser Natural Area, and Grand Lake. You can find it here. I have just gotten started researching the area, and I am already finding so many places I want to visit that I can’t possibly hit them all during a long weekend, or even a one week vacation. Also, I am going to try to come up with a format for this page that makes it meaningful and actually helps me prepare for my trips, so you’ll have to bear with me as I pull this together. I will be using the mapping software that came with my GPS unit and Google Earth in my research, along with the web. I am thinking I will start by creating some categories, such as state parks with hiking trails, or lighthouses I want to check out, and then build lists under each category of those places, starting from the south end and working my way north. Then, when I have the information assembled, break it down into a list of doable weekend trips. In the information for each place, I hope to put in directions, best times to visit, and links to more information on the web. 15 sites for tent or small trailers use. Hike to scenic Ocqueoc Falls along the Bicentennial Pathway or take advantage of good steelhead and trout fishing from the campground. Rustic campground includes vault toilets and potable water from well hand pump. Negwegon State Park is a rustic, undeveloped area open for hunting, walk-in camping and hiking. Click here for information on the four back country campsites. The terrain is a mixture of low land areas, with small ridges, to mature pine forest, with some hardwoods and aspen forest, with some pockets of open meadows mixed in. Negwegon hosts a beautiful undeveloped sandy beach on Lake Huron. Please use caution when visiting Negwegon as the roads into the park are often so sandy that a four-wheel drive vehicle is needed. Motorized vehicles are not allowed on the trails or off-road. Recreational Passport required for entry, $14 per night camping fee at the four backcountry sites. Take US-23 12 miles north of Harrisville to Black River Rd, Go east on Black River Rd for 1.5 miles, Drive North on Sand Hill Trail for 2.5 miles, Go east on the gravel park road 1.25 miles to the parking area. If traveling by kayak or canoe, the portage distance from the parking lot to the beach is about 1/8 mile. There are signs along the shore to indicate the location of each camp site. Situated along seven and a half miles of Lake Huron shoreline, this undeveloped park provides a rustic retreat for hikers exploring the park’s six miles of trails. Thompsons Harbor now has 2 rustic cabins. This is a definite must for me. Over 5,000 acres, miles of Lake Huron frontage, a well-marked 6 mile trail system, and many more miles of trails not as well-marked. Old roads, lakes, streams, woods, wetlands, and grasslands, yeah! Hoeft State Park is a heavily wooded 300-acre park with a mile of sandy, Lake Huron shoreline. The moderating effect of Lake Huron causes temperatures to be less extreme during both summer and winter and also causes up to two weeks delay in season changes compared to a few miles inland. This was one of the first 14 Michigan State Parks. The original property was donated by lumber baron, Paul H. Hoeft on January 2, 1922. A picnic shelter still in use was built in the day use area by the Civilian Conservation Corps in late 1930s. May be too busy in the summer, but would make a good fall trip combined with a visit to the 40 Mile Point light, since there is a bike/hiking trail connecting the two. Cheboygan State Park has a system of well-marked trails that provide access to scenic Lake Huron vistas and glimpses of rare wildflowers. One of the main focal points of the park is the site of the Cheboygan Point Light. Visitors will find the foundation remains of this once operating lighthouse. In 1851, the Cheboygan Point Light was originally built on a pier in Lake Huron, but due to rough water and winter ice, it only lasted a few years. In 1859, it was rebuilt on the shore and was in operation until 1930 by the United States Lighthouse Service. It was at this time that the lighthouse and surrounding properties were conveyed to the State of Michigan for public park use. A good jumping off point for a kayak trip to the Poe Reef and Fourteen Foot Shoal Lighthouses, which are right off the coast of the State Park. Nature trails and scenic overlooks provide a view of the wildlife and natural resources of this site, while the working sawmill and visitor center give a look at the rich history of the Straits of Mackinac and Mackinac Island. Most of Mill Creek State Historic Park is densely wooded and covered by one of the following five forest types: northern hardwoods, upland aspen, lowland aspen, mixed pine, or lowland cedar swamp. Mill Creek is open early May through mid-October. Three and a half miles of nature trails meander through the park’s 625 wooded acres. Hike the Beaver Pond Trail to see the dams and lodges of several families of beavers. Watch for these shy mammals at dawn and dusk. Deer, grouse, and woodcock may be seen on the Aspen-Wildlife Forest Trail. Watch for barred or great horned owls in the trees along the Sugar Shack Forest Trail. Listen for the songs of ovenbirds, American redstarts, black-throated green warblers, rose-breasted grosbeaks, veerys, and other forest songbirds as you explore the park. 140 acres with 10,000 feet of Lake Huron Shore Line. Great for outdoor recreation and enjoyment of the rich coastal resources. The waters offshore are part of the National Marine Sanctuary and Underwater Preserve, holding many shipwrecks. Contains a stand of mature, virgin red and white pine with spruce, balsam, cedar and birch. Includes over 4,000 feet of Lake Huron shoreline composed primarily of limestone gravel shore. Provides habitat for plant species of special concern, including the Pitcher’s thistle, a plant threatened with extinction. A mile long trail great for cross-country skiing or hiking takes you through ruins of the 1880’s logging village of Bell. A lagoon holds the hull of an old ship and the sandy beach is great for sunbathing. 5 miles east of US-23 on Grand Lake Hwy. From Alpena, turn left onto Alcona Road from Highway 23, and follow it for 1.1 miles to Lakeshore Lake. Follow Lakeshore Drive for 3.2 miles and turn left on Point Road. Sturgeon Point Lighthouse is about a mile down Point Road on the left hand side. The keeper’s house, which is now a maritime museum, and the tower are open to the public during the summer. For hours, click here. The grounds are open all year. Located on Thunder Bay Island, approx. 3 1/2 miles off the tip of North Point. The island and light are only accessible by boat. The lighthouse is owned by the Coast Guard and managed by the Thunder Bay Island Lighthouse Preservation Society. Grounds open, dwelling/tower closed. The rest of the island is part of the Michigan Islands National Wildlife Preserve and closed to the public except in emergency situations. The non-lighthouse side of Middle Island can be seen from the Rockport boat ramp. To reach the boat ramp, travel 9.4 miles north from Alpena on Highway 23 to Rockport Road. Take Rockport Road east 2.2 miles where it will turn north and lead 1.5 miles to the boat ramp. You can visit the lighthouse on volunteer trips to the island offered on summer weekends or even spend a night in the fog signal building. Call Captain Mike Theut at (989) 619-1013 for more information. The lighthouse is owned by the Coast Guard and managed by Friends of Middle Island Lighthouse. The rest of the light station is owned by Mike Theut and the Middle Island Lightkeepers Association. Grounds and outbuildings open to overnight visitors and tours, tower closed. From Alpena, travel north on Highway 23 for 10.4 miles and then turn right on Grand Lake Road. After 3.5 miles, you will need to turn right to stay on Grand Lake Road (there is a sign that will direct you to the Presque Isle Lighthouses). The road that leads to the Old Presque Isle Lighthouse will be on your right after 9.4 more miles and just after you pass the Presque Isle Marina. From Rogers City, travel south on Highway 23 14.5 miles to County Highway 638. Follow Highway 638 until it ends and turn left onto Grand Lake Road. The road that leads to the Old Presque Isle Lighthouse will be on your right after 0.8 miles and just after you pass the Presque Isle Marina. The Old Presque Isle Lighthouse is open from mid-May to mid-October, seven days a week, from 9 a.m. to 6 p.m. The keeper’s dwelling houses a museum, and visitors are allowed to climb the detached tower, which contains a fourth-order Fresnel lens. For more information, you can reach the lighthouse at (989) 595-6979. The lighthouse is owned by Presque Isle Township and managed by the Presque Isle Historical Society. Grounds open, dwelling/tower open in season. From Alpena, travel north on Highway 23 for 10.4 miles and then turn right on Grand Lake Road. After 3.5 miles, you will need to turn right to stay on Grand Lake Road (there is a sign that will direct you to the Presque Isle Lighthouses). The New Presque Isle Lighthouse is located at the end of Grand Lake Road. From Rogers City, travel south on Highway 23 14.5 miles to County Highway 638. Follow Highway 638 until it ends and turn left onto Grand Lake Road. The New Presque Isle Lighthouse is located at the end of Grand Lake Road. The New Presque Isle Lighthouse houses a gift shop and is open for climbing from mid-May to mid-October, seven days a week, from 9 a.m. to 6 p.m. For more information, you can reach the lighthouse at (989) 595-9917. The adjacent 1905 keeper’s dwelling houses a museum that is open from June 15 to Labor Day on Sundays from 1 p.m. to 5 p.m. and on Tuesdays through Saturdays from 11 a.m. to 5 p.m. During September and October, the museum is open on weekends only, as volunteer staffing permits. The museum can be reached at (989) 595-5419. The lighthouse is owned by Presque Isle County. Grounds open, dwelling/tower open in season. From Rogers City, travel north on Highway 23 for about six miles. The road which leads east to the lighthouse is marked on both sides by nice wooden signs. Note that this road is not Forty Mile Point Road, but is just north of Forty Mile Point Road. As you near the lighthouse, tune your radio to 107.3 FM to hear a recorded history. The Forty Mile Point Lighthouse and outbuildings are open every day but Mondays from 10 a.m. to 4 p.m. from Memorial Day weekend to mid-October. The lighthouse is home to a museum. The tower is open for climbing during visiting hours. The lighthouse is owned by Presque Isle County and managed by the 40 Mile Point Lighthouse Society. Grounds open, dwelling/tower open in season. 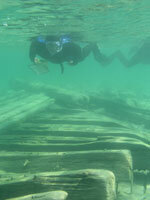 There is also one of many Lake Huron shipwrecks located very near the light, the wreck of the Joseph S. Fay. There is a two mile long bike path/hiking trail running from the light to Hoeft State Park. The lighthouse is best viewed by boat and can be seen on eastbound lighthouse cruises offered by Shepler’s. However, fair views are available from Lighthouse Point near the ruins of the Cheboygan Main Light Station in Cheboygan State Park or from a roadside pull-off scenic view about 5 miles east of the Cheboygan State Park entrance on US 23. The light is approx. 3 1/2 miles off the coast of Cheboygan State Park near the ruins of the old light within the park. The lighthouse is owned by the Coast Guard. Tower closed. The lighthouse is best viewed by boat and can be seen on eastbound lighthouse cruises offered by Shepler’s. Fair views are available at Lighthouse Point near the ruins of the Cheboygan Main Light Station in Cheboygan State Park. The light is around a mile off the coast from the ruins of the old light in the park. In Cheboygan, from Highway 23 take Water Street, the first street on the west side of the Cheboygan River, north for a block where you will see the light. You can also see the lighthouse on eastbound lighthouse cruises offered by Shepler’s. The lighthouse is open 9:00 a.m. to 5:00 p.m. on Saturdays, Sundays and Holidays from Memorial Day weekend through Labor Day weekend. The lighthouse is owned by Great Lakes Lighthouse Keeper Association. Grounds open, dwelling/tower open in season. Heading north on Interstate 75, take Exit 339, the last before the Mackinac Bridge. Turn left onto Nicolet Street and follow it to Michilimackinac Park where you will find the Mackinac Point Lighthouse. The lighthouse is open daily from mid-May to early October. Call (231) 436-4100 for more information. The lighthouse is part of Mackinac State Historic Parks. Grounds open, dwelling/tower open in season. Technically not a Lake Huron Light, it is on Lake Michigan, but it is only a few miles west of the straits, and I’ve never been there. It is also close to the Emmet County Park that was donated by the Little Traverse Conservancy, and is known as the Headlands. From Michilimackinac State Park drive south to Central Avenue. Turn right on Central Avenue and continue for just over two miles to where the road tees. Turn right onto Headlands Road, and the McGulpin’s Point Lighthouse will be on your right before the road dead ends. There is a gift shop in the lighthouse. Admission is free. The lighthouse is owned by Emmet County. Grounds/dwelling/tower open. Thunder Bay Island Lighthouse, 3 1/2 miles offshore on island that is accessible. Middle Island Lighthouse, 2 3/4 miles offshore on island that is accessible. Poe Reef Lighthouse, 3 miles offshore, no island, no place to stop. Fourteen Foot Shoal Lighthouse, just under a mile offshore, no island, no place to stop. I knew I shouldn’t have gone here. In only limited research, I have found information about several dozen shipwrecks that are in 20 feet of water or less, several were washed ashore and their remains are visible on the beaches. I have a few here to begin with, but there are far more to go. One could easily spend a week kayaking and snorkeling nothing but the shipwrecks. I’ll keep adding to this as time permits. Located in northwestern Lake Huron, Thunder Bay is adjacent to one of the most treacherous stretches of water within the Great Lakes system. Unpredictable weather, murky fog banks, sudden gales, and rocky shoals earned the area the name “Shipwreck Alley.” Today, the 448-square-mile Thunder Bay National Marine Sanctuary protects one of America’s best-preserved and nationally significant collections of shipwrecks. Fire, ice, collisions, and storms have claimed over 200 vessels in and around Thunder Bay. To date, more than 50 shipwrecks have been discovered within the sanctuary and an additional 30 wrecks have been located outside of the sanctuary boundaries. Although the sheer number of shipwrecks is impressive, it is the range of vessel types located in the sanctuary that makes the collection nationally significant. 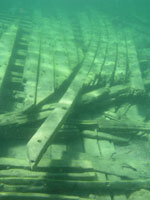 From an 1844 side-wheel steamer to a modern 500-foot-long German freighter, the shipwrecks of Thunder Bay represent a microcosm of maritime commerce and travel on the Great Lakes. Experience the Shipwreck Century as you battle the fury of a Lake Huron storm aboard a 19th century schooner. Explore a shipwreck without getting wet! No matter your age, a discovery awaits you at the Great Lakes Maritime Heritage Center! Featuring immersive maritime heritage exhibits, an HD theater, wooden boatbuilding workshop, a gift shop and exciting programs and events throughout the year. Bring your friends and family and dive into our Great Lakes past! OPEN ALL YEAR. FREE ADMISSION. Centerboard projecting from base of trunk. Description: Larger than the typical schooner of its time, American Union’s deep draft got it in trouble more than once. When rounding Presque Isle in a heavy sea the ship ran up on the rocks at Thompson’s Harbor and quickly broke apart. Its remains are now scattered and flattened on the lake bottom but are easily viewable to kayakers and snorkelers. Internal wooden arch along starboard side. Portside showing gangway hatches and hogging truss. Diver examining the engine mounts. Other places of interest that need further research. It looks like a great area to spend a day paddling in a protected bay on Lake Huron with many islands to check out. Located just north of Alpena. Even more interesting than the kayak paddle would be just on its own, the area around Misery Bay is being studied because of the sinkholes around there, both on and off shore. The prime focus of the study are the lifeforms that live in the sinkholes, but the geology of the karst formations is also worth noting. There are many shipwrecks in and around the bay as well, including the wreck of the German Freighter the Nordmeer, much of which is above water. With more than 30 miles of trails, hikers and skiers have their choice of routes for every skill level. Special pathways have been constructed for the traditional diagonal skier and the skate-skier. Pathways range from “Easy” to “Most Difficult”. Skiers may find themselves gliding under majestic pines, taking in views of Black Lake and, under the right conditions, even getting a glimpse of Lake Huron. Trail users travel through a number of forest types and are able to see what a managed forest looks like in its various stages of regrowth. Four separate parking lots provide skiers and hikers access to the pathway loops which best suit their abilities or interests. Onaway State Park is located on the southeast shore of beautiful Black Lake in Presque Isle County. The park encompasses 158 acres of rugged but picturesque land, including sand cobblestone beaches, large unique rock outcroppings and a diverse variety of trees. You may observe all these natural features by hiking the park’s three-mile nature trail. The campground, set among virgin white pines. The 76-acre Mystery Valley Karst Preserve and Nature Sanctuary is located in Presque Isle County just a few miles north of the Thunder Bay Karst Preserve. It contains one of the largest karst “collapse valleys” in the Great Lakes region, several dramatic earth cracks and a lake that rises and falls, and sometimes disappears. Visitors to the preserve can follow two self-guided trails: Earthcrack Trail and Valley Trail. Not surprisingly, Earthcrack Trail passes a series of cracks, including two that converge into one that’s several hundred feet long and nearly 15 feet deep. Following the Valley Trail, visitors can see fossils of marine invertebrates such as brachiopods, Bryozoa and crinoids that lived some 350 million to 400 million years ago. This is a large lake between Alpena and Rogers City, Michigan, and only a few miles inland from Lake Huron. US23 runs right along the west shore of the lake, and there are several very nice access points to the lake from US 23. The lake has many bays and islands to explore, it looks like a good lake to spend a day or two kayaking. The names themselves clarify how thrilling these places would be to experience. We have to credit the early explorers for coming up with names we still resonate too. Thanks again Cindy! We also have to give credit to the Native Americans who were here before those explorers, and had already named all of these places. Lake Huron is named for the Huron tribe that lived around the lake, and Ocqueoc Falls is the native name for the falls.